The KLAW quick connect Flange Lock is up to 50 times faster than traditional flange connections and is ideal for ship terminals wanting cost efficient and safe transfer solutions. Vessels could spend less time at berth and that means more ships off-loaded each week – delivering higher profits. The KLAW Flange Lock is self-contained and has no need for fussy nuts and bolts or spanners that can easily be lost and delay transfers – a steel bar or Flange Lock locking wrench is the only tool needed to lock or release the cam. A simple twist and the fully sealed Ratchet Cams are locked and ready for transfer. No more waiting around for numerous nuts and bolts to be fastened. No more trapped fingers or crushed hands due to elimination of the need to fit awkward gaskets. The KLAW Flange Lock is proven in the field to deliver efficiency and reliability. Ideal for hose transfer systems or loading arms located at ship terminals. All types of Liquids and Gases. 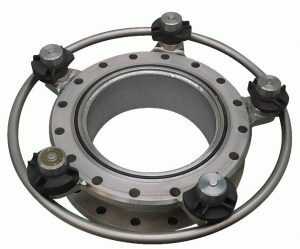 A wide range of flange styles are accommodated. Non-pressure retaining Blank Flanges and Lifting lugs also available. Call the KLAW technical support team for full specification and application details.